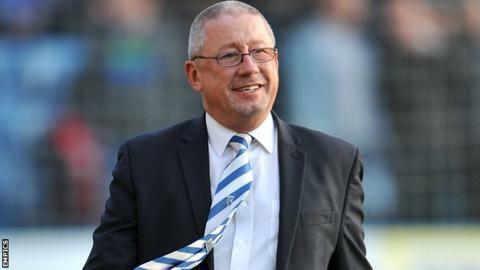 Gillingham chairman Paul Scally says he has "no idea" who will be the League One club's new manager. A four-man caretaker management team have been in charge since Peter Taylor was sacked on New Year's Eve. "This situation will become clearer as we progress the interview stage this week and next," Scally said in an open letter to fans on the club's website. "We will work our way through the fairly long shortlist in a professional and methodical manner." He added: "We will not fuel rumours, nor speak on individuals either way, but we will get on with the task, aware that this is a significantly important appointment that we must try and get right." Taylor was dismissed after 14 months in charge at Priestfield Stadium, despite winning two of his last four games and with the club lying two points above the relegation zone. Scally told BBC Radio Kent he had not intended to sack Taylor until a phone call with the 62-year-old convinced him otherwise, and cited the abuse the one-time England boss had received from supporters as a factor in his decision. Scally described the abuse which Taylor, above, received from Gillingham supporters as "unnecessary, unpleasant and unhelpful"
Scally, who has been Gillingham chairman since 1995, admitted he had been "somewhat caught unprepared for a managerial change" but the process of finding a new manager had begun immediately. "I am flattered to have received many applications from a cross-section of individuals, many of whom would be suitable for the role," he added in his statement. "I have not met with any candidates face to face [but] have spoken to a number of influential managers and individuals in the game about various candidates." Gillingham's four-man caretaker team, which comprises Taylor's former assistant Andy Hessenthaler, academy manager Darren Hare, under-18s coach Steve Lovell and development squad coach Mark Patterson, have tasted defeat in all three games since being placed in charge. Scally confirmed that none of those four men are being considered for the role permanently but they will be consulted in the recruitment process. "I will be discussing all candidates with them and my co-directors and they will all be sitting on interviews with myself," he said. "This is neither a quick nor simple task and, whilst we would like to make an appointment as soon as possible, we will not rush into a decision if we do not all feel comfortable with it."